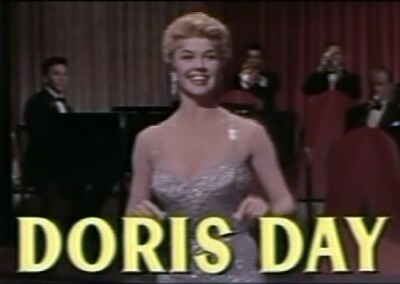 Screenshot of American actress and singer Doris Day in the trailer for the film Love Me or Leave Me (film) (1955). Ms. Day was also an animal welfare advocate. Doris Day was one of the best known actresses in the United States in the mid to late twentieth century. Doris Mary Ann Von Kappelhoff was born on April 3, 1922, in Evanston, Ohio. She wanted to become a dancer but a 1937 automobile injury left her right leg severely injured. Von Kappelhoff took singing lessons and performed in an amateur competition for WLW, a Cincinnati radio station. She sang "Day After Day," won the competition, and became a regular performer on WLW. Von Kappelhoff soon was singing with the popular big bands of Barney Rapp, Bob Crosby, and Les Brown. It was Rapp who suggested that Von Kappelhoff assume a new stage name. Doris chose Doris Day. She took her new last name from the song that she had won the WLW song competition with several years before. While singing with Brown's band, Day enjoyed two number one hits, "Sentimental Journey" and "My Dreams Are Getting Better All the Time." Day remained a big band singer until 1946, when she embarked on a solo career. In 1948, she turned to acting and starred in Romance on the High Seas. Her movie career peaked during the 1950s and 1960's, Day starred in Calamity Jane (1953), The Man Who Knew Too Much (1956), The Pajama Game (1957), Please Don't Eat the Daisies (1960), Midnight Lace (1960), and her final feature film, With Six You Get Egg Roll (1968). She was nominated for an Academy Award for Pillow Talk (1959). She won an Oscar for her singing of "Que Sera Sera," in The Man Who Knew Too Much (1956). In 1968, Doris Day moved to weekly network television with The Doris Day Show. This show remained in production until 1973. With the completion of The Doris Day Show, Day became a spokesperson for animal rights. She started several nonprofit organizations, including the Doris Day Animal League and the Doris Day Animal Foundation. She lobbied for an end to inhumane treatment of animals in laboratories. In 2004, Day won the Presidential Medal of Freedom for her philanthropic efforts.